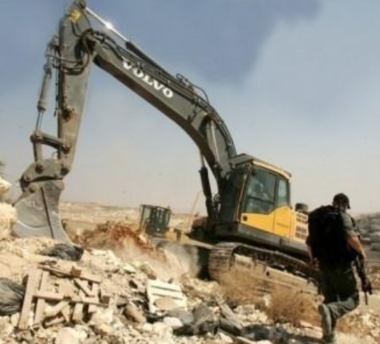 Israeli soldiers invaded, on Sunday morning, Beit Iksa village, northwest of occupied East Jerusalem, and demolished agricultural sheds and structures, owned by two siblings. Bilal al-Mashni, a member of Beit Iksa Village Council, said the soldiers surrounded the entire area of the properties, and preventing the Palestinians from entering or leaving it. He added that the soldiers demolished a hothouse, and several agricultural structures, owned by Haitham and Ibrahim Abdul-Wahab, under the allegation of being built without permits. Beit Iksa is inhabited by nearly 2000 Palestinians, and is surrounded by the illegal Israeli Annexation Wall, while the residents can only enter of leave, their village through one gate constantly manned by soldiers who subject them to ongoing violations and humiliation. Although the village is in Jerusalem, the Palestinians are not granted the Israeli-issued Jerusalem ID cards, and face repeated violations to force them to leave for the benefit of Israel’s illegal construction and expansion of its colonies.